Alevtina Biktimirova is the fourth different woman from Russia to win in the last four years. Alevtina Biktimirova wasn't to be denied this time, and Russia's dominance lives on. Rainy weather wasn't conducive to any record-breaking scenarios, but Biktimirova outlasted a friend and two contenders from Japan to take the 35th Honolulu Marathon in 2 hours, 33 minutes and 7 seconds yesterday. She became the fourth consecutive Russian woman to win here. They have captured seven of the past eight local marathons. "I'm very happy (to break through this year)," the soft-spoken Biktimirova, 25, said through translator Dainora Puida. "I was trying as hard as possible." Biktimirova held off Japan's Akemi Ozaki, a pace-setter who decided to finish out the race, for good by pulling away at about the 21st mile (leaving Hawaii Kai) with a powerful and relentless stride. Ozaki, somewhat of an unknown, gradually fell out of sight, and finished more than a minute back at 2:34:22, despite a graceful style and cheery outlook. She said she decided to remain on pace after the 13.1-mile halfway point -- the normal finish for a rabbit -- before the race started. "I was told to lead the race until the half of the marathon, but it was really hard (to stop)," she said. Biktimirova's friend and fellow Russian Tatyana Petrova finished third at 2:35:56 after coming on late. With more than half of the race's 27,829 entrants from Japan, Ozaki, 30, had plenty of support down the stretch from runners headed the other direction into Hawaii Kai. She weaved side to side after about the 20th mile as a sign of fatigue, but often waved at her enthusiasts; she ran the Tokyo Marathon less than a month ago in 2:28. Biktimirova, meanwhile, just kept plodding away after extending out of a group that included Ozaki, her countrywoman Kaori Yoshida, and about eight stubborn men. A key moment occurred on a causeway on the way out of Hawaii Kai. While going up an inclined bridge over a stream at the 17th mile, Biktimirova hit another gear and only Ozaki was able to keep the pace. It broke up the pack that had run together since the start. "(When I pulled away) that's when I felt I had the most (momentum)," said Biktimirova. "I felt very good then." She knew she had it won after 30 kilometers, or about the 19th mile, when she and Ozaki weaved around one another. It turned out the Russian was only probing. Biktimirova crested Diamond Head on the return to Kapiolani Park in full control and didn't look back -- unlike Ozaki, who was forced to look over her shoulder several times early at the stubborn Biktimirova. It's Biktimirova's second career marathon win. She set her personal record of 2:25.12 at Frankfurt, Germany, in 2005, and came in at 2:29:42 last year in Honolulu behind Lyubov Denisova. Her victory is good news for race director Dr. Jim Barahal. Now he has a women's winner who -- pending the results of a mandatory drug test for the top three finishers -- is welcome back in the islands to race, unlike Denisova, who broke the women's course record but tested positive for elevated levels of testosterone in March. "I think (Biktimirova's) a very strong runner, definitely an up-and-comer," Barahal said. "It's nice to have a new champion. We don't have to kind of hide from our champion. "Now that we do drug testing, I think we move forward with confidence (because) we don't have to worry about that happening again. It was probably a wake-up call for us. We woke up." Kailua-Kona resident Bree Wee is fresh off a a win in the Ironman Triathlon. Standouts from Hawaii in yesterday's Honolulu Marathon included Jonathan Lyau, 43, perennial winner of the kamaaina award given to the top finisher born in the islands. His time was 2:47.52. HPU student Esben Dalgaard, 22, was the first Hawaii resident in 2:36:40. On the women's side, 27-year-old Bree Wee, who dazzled the athletic world with her age-group win in the Ironman Triathlon World Championship in October, was the first female resident to finish in 3:03:11. "I felt awesome almost the entire race," Wee said while dashing to the airport to catch a flight back to Kona. "Coming down the hill I had a little bit of cramping in my calves. I was trying so hard (to break 3 hours), but I just didn't have it in me. But I'm still really happy because I left everything on the course." Wee, who had a baby 17 months ago, ran 3:24 for the marathon at the end of the Ironman Triathlon, where she also finished at the top of all female Hawaii residents. 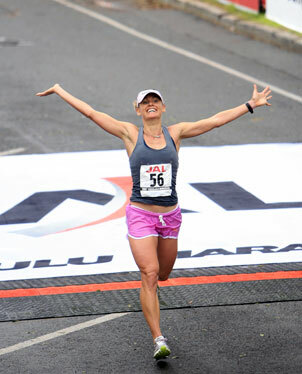 She and 31 other people traveled from Kona as she participated in her fourth Honolulu Marathon. "It's just a blast," she said. "It's really well organized and so much fun." Rachel Ross, 31, and Sayuri Kusutani, 48, were the other top local female finishers in 3:12:19 and 3:14:58, respectively.